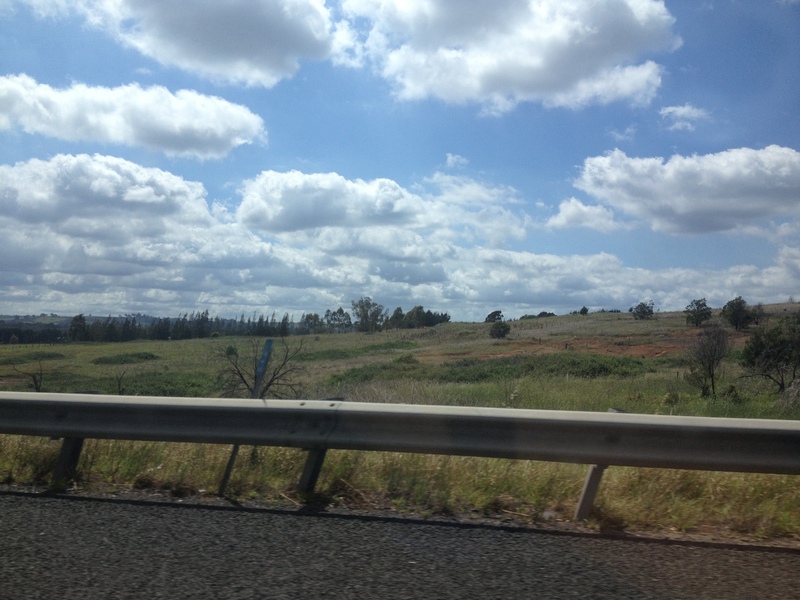 We are driving down to Canberra for a wine tasting cruise. I sit in the back of the car staring at the passing country and watching the groups of cows chewing sedately, always huddled in groups. I can see a wind farm in the distance. For some reason wind farms make me nervous. Silent and white in the distance, they seem alien in the landscape; a stark reminder of how much we have hurt the planet. The beauty of open land is its simplicity. Spread open ground of grass, rows of identical trees forming wind breaks on the tops of hills and wooden fencing that seems to have grown there. As soon as we are out of the city, I can feel my mind relax. It is like my brain takes a big sigh and has space to stretch out. I haven’t left the city in ages so I am relieved to finally be out of the concrete jungle. Even the windmills just dissolve among the clouds in the distance. I wake up with an alarm in the morning but I fall asleep again for a few minutes. I have no idea what happens in this short space but suddenly I am in a vivid nightmare where my thumb is being torn off and blood is going everywhere. Something wakes me up again and I am scared to fall asleep again, knowing that nightmare is just there, waiting for me beyond the veil of sleep. I try to force my eyes open. I am so tired. 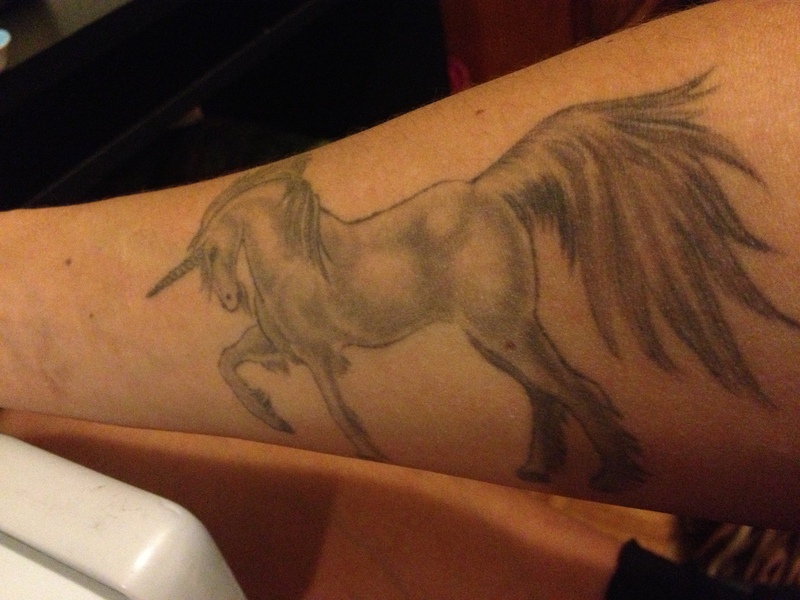 I look at the unicorn tattoo on my arm. When I was little I used to get nightmares a lot and my mum would always get me to visualise a unicorn. She described it to me down to the smallest detail until I stopped crying and calmed down. When I grew up I found out that this is called a nightmare chaser. In the same way people have a chaser after doing a nasty shot, the unicorn is supposed to cleanse the mind of bad thoughts or nightmares. Mum didn’t know about this, she just intuited it. The unicorn on my arm is from a picture we found growing up. Incidentally, it was one of the first images that came up when I first found the “unicorn chaser” app on facebook. Well my unicorn sits on my arm now, where I can look at it. She is poised to chase the bad dreams away. I force my eyes open and looking at my arm, eventually calm down and the nightmare dissolves. Still works. I have dinner with one of my best friends after work. We met at a yoga retreat a few years ago. We were roommates and we bonded immediately. Tonight we are giggling and talking quickly (she is Italian) and she suddenly tells me how grateful she is to have such amazing friends. I am too, I realise. I look through some photos of my friends and realise how much love I have for these women that surround me. I have never had such a strong network of sisterhood but now that I do, I couldn’t live without any of them. I can’t stop yawning! I am so tired. As soon as we get a break I race down to the coffee shop for a double shot coffee. I rarely have more than one coffee a day and it is always a small with a single shot. Twenty minutes later I am in the office doing handstands. Caffeine really is amazing! I went from nearly asleep to hanging out upside down. But I know how short lived this is. In yoga, we say deep breathing and backbends are like the yoga coffee that invigorate and energise us. But sometimes a little coffee helps too. An over-indulgent birthday weekend full of wine, coffee, chocolate, cake (even though it was raw and organic), dairy and wheat, has left me feeling bloated and sluggish. I have most of the morning free so I have booked in for a detox at The Last Resort. By detox, I mean a colon cleanse. It isn’t the most pleasant or comfortable way to spend an hour, but afterwards I feel amazing! The naturopath at The Last Resort is young, friendly and gentle. The music is soft and relaxing and the faint smell of incense makes the whole spa feel like a beautiful retreat within the heart of North Bondi. When I get back to my car I realise it is full of sand, crumbs, nuts and dried fruit. All the telltale signs of a woman who works and lives out of her vehicle. I decide to pay someone else to clean it when I wipe my finger on the dashboard and it comes away black. While I am in the shopping centre, I make the final step of my cleansing process and get my legs waxed. It feels like I have taken a long swim under a waterfall after all these cleansing practices! Even the rain washes away some of the residual misery in the streets. Refreshing and light, I feel like I have danced naked in the rain.